Sparaxis or ‘Harlequin Flower’ are a spring flowering bulb or corm that are easy to grow are very colorful. Sometimes called ‘Harlequin Flowers’ this gives us an indication of the bright cheery flowers. With around 12 species and a number of sub species the variety in flower colour is wide. From whites through to orange, yellows and reds they grow well in Australia. Coming from South Africa they are well adapted to our Mediterranean climate and are very easy care, both in the garden and in containers. Sparaxis tricolor with its orange flowers bright yellow throat edged with black is a wonderful species used widely in hybridisation. Sparaxis grandiflora is a varied species flower color ranging from white through to purple and deep red depending on sub species. Sparaxis bulbifera has pale creamy white flowers. All are both a native of South Africa and grow from corms. Well suited to a Mediterranean climate, Sparaxis prefer full sun to part shade and a well drained soil. Generally hardy and only requiring minimum care, such as a tidy up of old foliage as it dies back. If growing in containers re pot every 3 – 4 years to prevent overcrowding and encourage vigor. 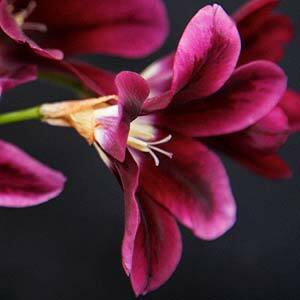 Sparaxis Bulbs are available for sale from the following nurseries.